In 2013, Katie and Sydney Dance Company worked together on an incredible production; Les Illuminations. An evening of breathtaking dance, contemporary design and spectacular music up close with Sydney Dance Company, Katie Noonan and musicians of Sydney Symphony. Featuring choreography by Rafael Bonachela and costumes by Toni Maticevski, Les Illuminations celebrates the centenary of one of the world’s greatest composers, Benjamin Britten. Performed in two parts, Les Illuminations is a reflection of love in all forms. First performed in the early 1940s and devoted to lifelong companion Peter Pears, the score for Britten’s Les Illuminationsis set around the suite of romantic poems by French poet Arthur Rimbaud. This was the second time Katie Noonan has worked with Sydney Dance Company, having previously collaborated with Rafael Bonachela for LANDforms (2011). Les Illuminations marks Toni Maticevski’s second foray into contemporary dance costume design, with his first venture winning a 2012 Helpmann Award. Katie and Sydney Dance Company performed the work in Brisbane 2014 with the Queensland Symphony Orchestra. Love-Song-Circus is a moving and truly unique work of pure beauty based on the stories of Australia’s first convict women. 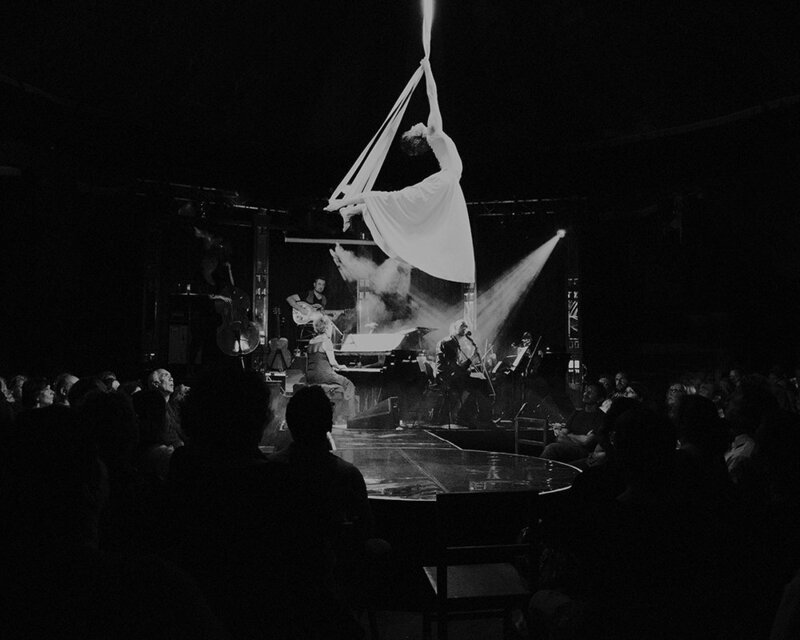 Combining textures of folk instrumentation, string quartet, piano and Noonan’s angelic voice with the graceful physicality of 3 of Circa’s acrobat/ aerialists, this work shares these untold stories within an evocative, beautiful and emotionally engaging performance. The seeds of this project were sewn a couple of years ago when Katie Noonan read of an exhibition at the National Museum called Love Tokens. This collection contains 307 tokens dating from 1762-1856, most of them fashioned from the 1797 Cartwheel penny. These pennies proved perfect as tokens – they were cheap, made of a soft copper and were quite large – providing plenty of space for inscriptions. Convicts would engrave them with messages and images for the loved ones they had to leave behind. 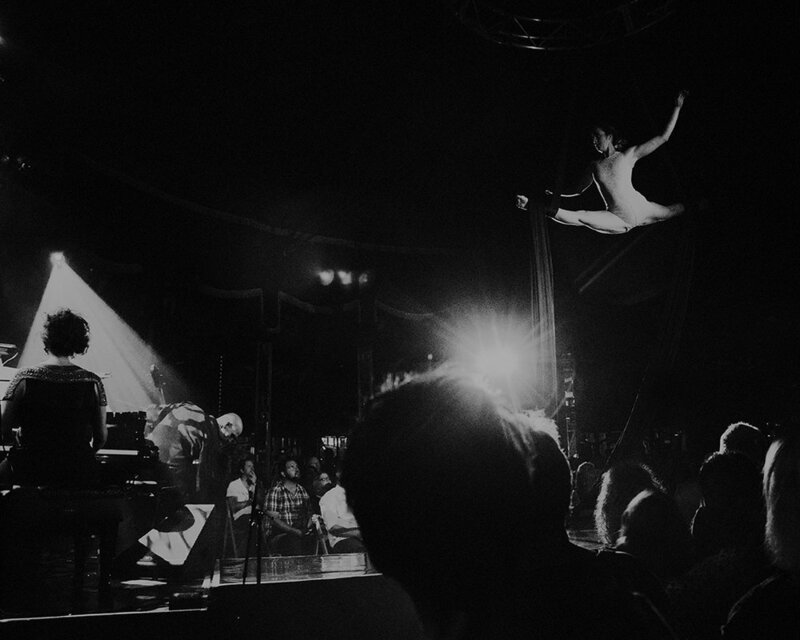 Love-Song-Circus premiered at the 2012 Adelaide Cabaret Festival to full houses and rave reviews and played to packed houses in the Spiegeltent in Melbourne in early 2013. Early 2005 in Sydney’s Angel Place, I heard Joe Lovano play saxophone live for the first time and my fascination with his playing was ignited! A couple of years later I found myself dreaming up a project where I could combine my two main loves – pop music and the freedom of jazz improvisation. It was then that the seeds of my homage to the incredible writing of Lennon and McCartney were sewn. Somehow I found myself talking to the legendary Joe Lovano and dreaming up a crazy stellar band. In late 2008 I jetted of New York City with my husband and 2 darling boys to make a record with the very best jazz musicians in the world. I still don’t know quite know how it happened but I know I am very grateful and blessed. To be in the studio with Mr Ron Carter in duet on the tune “I will” will be something I will cherish til the day I die. This album was a life affirming moment for me. Years later I was involved in helping to bring Mr Carter and his trio ( w Mulgrew Miller and Russell Malone) to Australia for the very first time – again such a wonderful honour to once again share the stage with him. Wow.. this album was such a huge journey to make. My first album without my beloved band behind me, my first album as a solo artist, my first album as a married woman and all recorded between the time of 3 and 8 months pregnant (and writing a bunch of it in Sydney, LA and NYC).. Woah mumma.. I love the themes I explored on this album – I was a madly in love newlywed experiencing the miracle of pregnancy – it was quite a trip to document! Inspired by Donny Hathaway, Aretha Franklin, Stevie Wonder and our own great Vince Jones this album was all about exploring groove for me. I learn’t a huge amount making this album and I am really grateful for the arduous journey I took with this process, as since then, it has confirmed my instinct to listen to and trust my inner voice. For this album, Katie co wrote with a host of Anzac luminaries including Tim Finn, Don Walker, Sia Furler, Josh Pyke, Tom Shapcott and her fellow ‘Captains’ band mates. Co -produced by Katie and Grammy award winning producer Nick Didia this album was widely acclaimed, with Rolling Stone Magazine’s 4 star review saying “it is a joy to hear Noonan return to the more traditional pop of Emperor’s Box, albeit with a sumptuous and skewed take on the art form that combines the experimental beauty of Sigur Ros and Radiohead with the dark, dreamy atmospherics of 27”. After being asked to do the 10th annual Brisbane concert series ‘Woman in Voice’ with my mother – renowned classical soprano Maggie Noonan – Martin Buzacott from The Queensland Symphony Orchestra suggested we make an album with the orchestra for Abc Classics. Under the baton of the fantastic (and very funny and quite naughty!) conductor Guy Noble this was such an incredible experience to share the recording studio with my mum! Joined by some of the finest jazz musicians ( Sam Keevers, Brett Hirst and Simon Barker – who I have since gone on to make much more music with), the wonderful orchestra and a great jazz horn section led by the beautiful trumpeter (and my university mentor) John Hoffman, making this album was a pure joy. With the wonderful guidance of Lyle Chan and the recording prowess of Virginia Read we made this album live (yes live – all 80 of us!) at Ferry Road Studios in Brisbane in 2003 and released the album in 2004. Post release Mum and I had the great honour of touring Australia playing with our finest orchestras. After meeting Paul Grabowsky dressed in a garbage bag (to keep dry from the rain !?) at the Woodford Folk Festival sometime in the early noughties, Paul came and heard elixir sing and soon after asked me to join the Australian Art Orchestra on a European tour. I was, suffice to say, thrilled to be thrown into the deep end with such fine musicians in a fantastic multi arts production called “The Theft of Sita”. Soon after this, Lyndon Terracini commissioned Paul to write a song cycle for the Queensland Music Festival with the wonderful late poet Dorothy Porter. Written for myself and an incredibly virtuosic quartet featuring some of Australia’s most fearless jazz musicians (namely Scott Tinkler – trumpet, Philip Rex – double bass and Simon Barker – drums/cymbals), this album was one of the hardest albums I have ever made! Not only musically challenging but I was babe in the woods with this intense band!! I remember doing one of our first live takes and going outside and have a good cry in the gutter (much to Paul’s concern!!) Nevertheless I came out the other side relatively unscathed (!?) and am extremely proud of this album and we had a great time touring Australia with this music. Later that year this album went on to win the 2005 ARIA award for best jazz album – yeeha grandma! This was a beautiful project in which the imagery of photographer Bill Henson was set to the soundtrack of the Australian Chamber Orchestra led by Richard Tognetti. It was a wonderful meeting of two great creative minds and I was thrilled to be involved as a soloist. It was such a treat to be surrounded by the intense musicality of this group of stellar musicians and be swept up in Bill’s incredible, dreamy imagery. In early 2011 I had the great honour of performing live with the Sydney Dance Company under the direction of the lovely Rafael Bonachela. It was so lovely to work with artists who are equally obsessed with the vision of what they do but in a completely different artform – very inspiring! Check out the link below to see excerpts from this beautiful piece. In July 2011 I was extremely proud to be involved with the world premiere of The Little Green Road To Fairyland for the Queensland Music Festival. A dream of QMF’s artistic director and friend of mine Deborah Conway, it was pure joyful escapism to explore this gorgeous Australian fairytale. Wrapped around the choreography and direction of Rosetta Cook (who, coincidentally my mum shared the stage with when I was a little girl) and the delicious cinematic music of Elena Kat’s Chernin this was a very special performance to be a part of. In October 2011 I fulfilled a dream of mine to journey through my songs of the last decade with a chamber string orchestra and special guests. This was such a thrill performing these concerts – in Melbourne at the beautiful Recital Hall with the Melbourne Symphony Orchestra and in Sydney at the Sydney Opera House’s iconic Opera Theatre with a chamber orchestra lead by my friend Myee Clohessy and featuring many friends of mine from the ACO. This was a very special project to be involved with – sharing an awesome Nick Cave song with our countries finest musicians and creators in one of our most iconic spaces. For me it was particularly poignant as the day I recorded my part on the Sydney Opera House stage with the Sydney Symphony Orchestra was the day our legendary Dame Joan Sutherland passed away… I felt extra blessed to be in that space on that day. Recently I have had the pleasure of being engaged as a presenter for various events and TV activities and I am enjoying exploring this different type of performance. Some of the highlights have been hosting the Red Carpet for the 2011 Helpmann Awards, interviewing Jamie Cullum and Chris Botti for Studio and presenting an award to Gotye at the 2011 ARIA Awards.